Massively multiplayer online games—sometimes called MMOGs or MMOs—appear far too rarely on the Mac. Since 2004, World of Warcraft has pretty much dominated the MMOG scene. So it was exciting news early in 2007 when it was revealed that CCP Games was readying a Macintosh version of EVE Online, its MMOG set in outer space. The game was released in early November, and since then, may Mac players have joined the ranks. EVE Online is an MMOG of a different stripe from World of Warcraft. There are no orcs, no magical powers, no fantasy setting. This game takes place in a galaxy at the other end of the Universe, where, thousands of years from now, humanity has come to inhabit. But due to a cosmic calamity, the human race was cut off from its homeworld and ultimately backslid into a nearly feral condition, forgetting about space flight or high technology, just scratching out a basic existence, struggling to survive. After millennia, humans once again travel the cosmic byways and have repopulated their adopted galaxy, spreading across thousands of solar systems. Mankind is still fundamentally homo sapiens, though we’ve changed over time. Five different factions—the de facto “races” of EVE—have populated space. There are the Gallente—the only true democracy of the game, a federation of many different worlds. There are the Amarr, a strictly regimented caste-based order that believes in religious conformity and supports slavery. There are the Caldari—a state run by corporations that generate their wealth by supporting constant military efforts, and then there are the Minmatar—ferocious and brutal, they’re former slaves of the Amarr who have sworn never to be subjects to anyone again. Those are the four playable races of EVE; there’s also a fifth human group, the enigmatic Jove, who players aren’t allowed to become. Still, they influence what’s happening in the EVE universe by seeding their own high technology to different factions within the game. To play EVE is to become the captain of a spaceship. This game owes a debt to the many space-trading games that have preceded it; classics like Elite, for example (and Mac users will, no doubt, recognize Ambrosia’s Escape Velocity in that lineage, as well). You spend your entire time within the game flying from system to system, first in a small vehicle, then in gradually larger ones—everything from nimble, lightly armored frigates to heavily armored battlecruisers. You’re only limited to what you can fly by your budget and your skill set. And unlike most MMOGs, you don’t gain skills by getting experience. This is the future, where you can simply “plug in” new skills to your head. That means that your pilot can learn new abilities—say, how to use cybernetic implants, or the finer points of calculating an enemy’s trajectory to aim guns at them effectively—whether you’re playing the game or not. It’s clever, because it keeps you constantly coming back to the game to check on the status of your pilot and to begin picking up new skills, and it gives you an incentive to fly out and try out the new skills as they’re mastered. Some skills—at least at low levels—may only take an hour or two to gain a basic proficiency in. Others can take weeks or months (of real time) in order to learn. PC-based EVE players interested in wasting as little time as possible between skill building have long relied on a Windows app called EVE Monitor to let them know that their pilot’s skill training is complete, even if the game isn’t running. Fortunately, Mac users can get the same using EVE Skill Monitor, a free Dashboard widget. Piloting a spaceship is only part of the fun in EVE; you can mine ore, manufacture products, blow things up; the universe is your oyster. In between space flights, you spend time in stations. Almost every solar system in EVE—and there are many—features at least a few outposts you can visit. Some may be state-owned while others may be corporation-controlled. Many of these feature non-player characters—agents, as they’re referred to in the game—who may be willing to give you work in exchange for ISK, the currency in the game, which you can then use to buy new skills or new equipment on the open market. Some of the missions are milk runs—ferrying cargo or passengers from one system to another—while others may involve quelling pirates, recovering stolen goods, or other dangerous activities. Most players cut their teeth on EVE by depending on these agents to line their pockets. Successfully completing missions for agents will improve your standing with them and may lead to bigger and better missions with their colleagues. Fail them, and don’t count on getting decent work out of them again. EVE features a fantastically rich and complex character creation system that will ultimately affect what sort of skills and aptitudes your in-game character excels in, similar in outcome (if not exactly the same as) what you might find in a real Dungeons & Dragons-style adventure. But regardless, you are not required to conform to a specific role in EVE; in many ways, it’s the ultimate sandbox game. You can become a miner and refine ores you gather from nearby asteroid fields; you can become an industrialist and take refined goods and manufacture them, selling the products to other players who need what you have. You can become the captain of a mercenary vessel that rents itself out to the highest bidder, to participate in corporate espionage. You can be a pirate. It’s really up to you, though the character creation process—once you’ve experienced it a few times—can help you “hedge your bets” by rolling a character that’s going to demonstrate abilities and aptitudes you want. You can manage up to three characters simultaneously, per account, although only one can be trained at any specific time. Fundamental to this sandbox philosophy—and really fundamental to the entire EVE experience—is the concept of player-run Corporations. Corporations in EVE fill the same niche that Guilds do in World of Warcraft—they’re a collection of like-minded gamers who all work towards a common goal. There are miner corps, manufacturing corps, pirate corps (many, many pirate corps), and corps that specialize in Player-versus-Player (PvP) competitions to wage wars against each other where it’s allowed. Finding the right player corp is almost vital to really getting the most out of EVE. It’s very, very hard to be a “lone wolf” in this game. There are other benefits to being in a player corp, as well—some of them will pay for your ship and equipment, for example. There are even corps that specialize in helping out beginners (EVE University is probably the best known). One thing you should absolutely count on in EVE is losing your ship, over and over again. Turns out the galaxy where EVE takes place is full of bloodthirsty cutthroats (not just computer controlled ones, either—the other players can be pretty mean, too). So it pays to have a clone on hand. (You get one as soon as you start playing, and you can upgrade yours as your skills improve.) That way, if you’re “pod-killed” (you, as the pilot, occupy a pod that can be blown up after your ship is destroyed), you can regenerate without having to start from square one. You might lose a day’s worth of training, but you’ll have cash on hand to buy a new ship, whatever’s in your bank account (plus whatever you’ve bought for insurance, which is also available). If you make it back to the area of space where your ship was destroyed quickly enough, you may even be able to recover some of your cargo and supplemental systems, too. Another difference between EVE and other MMOGs is that this is one, persistent, shared game world among all players. Unlike World of Warcraft, where hundreds or a few thousand players might share a single instance of the WoW universe on a specific server, all EVE players are playing the same game. As a result, CCP Games operates one of the biggest supercomputing clusters in Europe to handle the load, which regularly exceeds 35,000 players at peak times. This leads to a certain amount of lag and performance issues, especially in areas that attract a lot of players (one, in particular, a very heavy trading system called Jita, is notoriously slow). It can also cause some performance slowdowns in low-security areas where players are staging large fleet battles against each other. But for people who may just be “ratting” (a term for fighting small skirmishes with computer-controlled opponents) or going on mining runs, this really isn’t that much of an issue. It is worth noting, however, that EVE Online has existed in one form or another since 2002. So you’re jumping into a world that’s already got more than five years of history, and a lot of very experienced players. There’s a huge back-catalog of stories and folklore that has already been created for EVE, as well. It’s a very richly detailed game universe. While some gamers may take a gruff approach to newbies, there are a surprising number who welcome them, too, and are willing to offer help and advice. EVE was created for the Macintosh by TransGaming, which used its Cider translation layer technology. That means that EVE Online only works on Intel-based Macs. And while I’ve read reports that MacBook users have gotten the game to run, MacBooks don’t meet the minimum system requirements because of their Intel integrated graphics, so the only recommended systems are Macs like the MacBook Pro, iMac and Mac Pro. 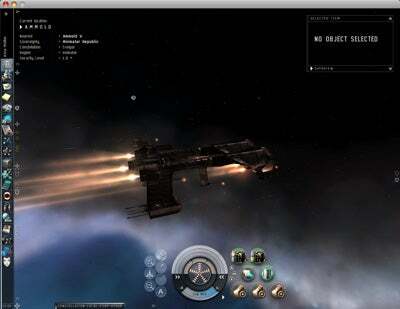 Since November, TransGaming and CCP have rolled out a few updates for the Mac client of EVE. What’s more, CCP has rolled out one of the most major changes to EVE in its history—the release of a new expansion pack called Trinity. In another differentiation from World of Warcraft, CCP doesn’t sell expansion packs separately from the core game: they’re included as part of the download that you make when you first buy or try out EVE as a trial account. So there’s no extra charge for this. What made Trinity such a major event for the EVE-playing world wasn’t the new content that’s been exposed in the game as much as a brand new graphics engine that enables Windows users with DirectX 9.0c-capable video hardware of seeing gorgeous new spaceship and space station models. Unfortunately, that new graphics package hadn’t made it to the Mac yet, as this review was written; CCP and TransGaming promised it for Mac users sometime in the first calendar quarter of 2008. So for now, anyway, Mac users are relegated to running EVE “Classic.” Which really doesn’t look bad at all, if you like the cinematic scope of games like Homeworld II, for example. The Mac version of EVE Online has, frankly, had a bumpy release. EVE veterans who switched to the Mac client immediately noticed that it runs considerably slower than its PC counterpart, for example. TransGaming’s expectation that EVE Mac ran 85 percent of the speed of the native Windows version may hold true for scenes where you’re just flying around, but when you get into serious combat, you can drop into single frame rates. The software has also been plagued with reliability problems since its release. It will quit unexpectedly, sometimes at very inopportune moments, such as when you’re traveling through a stargate (a portal that lets you hop from one system to another) or when you’re docking into a space station, or when you’re trying to have a conversation with an agent. Some less patient EVE Mac players have gone back to Boot Camp and Windows XP to play the game. There are also a few peculiarities you have to deal with because this game is running inside of a Cider translation layer. Some of the game’s audio and video options don’t seem to make a lot of sense to Mac users accustomed to recognizing things designed to work on our operating system, and some things may confuse veteran EVE players. For example, there’s an option in the PC version to switch to windowed mode that’s missing from the Mac version. Mac users invoke windowed mode instead by using TransGaming’s trademark command-enter function, a common feature of “Ciderized” games, but one that’s not very clearly documented. Not only has TransGaming had to contend with Trinity’s release but it also had to deal with Mac OS X v10.5 Leopard’s rollout. So it’s had its hands full with supporting this particular title. That doesn’t absolve TransGaming of responsibility for fixing the many reliability issues that EVE Mac players have discovered so far, but it does go a way to acknowledging that the developer has a full plate. For its part, CCP’s quality assurance department has been quite responsive to acknowledging problems and wants to work with the user base to make things better; it solicits feedback both in game and through the company’s user discussion forums on the EVE Online Web site. But acknowledging problems and fixing them are two different things, and I can’t let this go unnoticed. You really have to be patient with the Mac release of EVE in the state that it’s in right now. In some cases, you may go days, weeks even, without seeing any problems, then you just may hit one day where you can’t get the game running for more than a few minutes or an hour without having to restart it. It can be maddening, especially when you’re paying a monthly fee to play. I’ve gotten really burned out on World of Warcraft, and it’s nice being able to plunge head-long into a new online universe to explore and get to know. And having been weaned on countless hours of space opera on television and in books, comics, manga, and anime, I’m only too happy to experience the world of EVE Online as something real, visceral, and populated both other like-minded individuals who want to share the same experience. An absolutely mind-blowing “sandbox” MMOG, EVE Online will take you months, if not years, to explore. Just be willing to put up with some unreliable behavior from the Mac version until the developers can straighten things out.